Two ads tell you everything you need to know about how crazy notebook PC pricing is. The first, a Dell Black Friday ad from 2010, advertises a Dell Inspiron 15 for $450—the “doorbuster” the PC company used to lure shoppers to Dell.com. 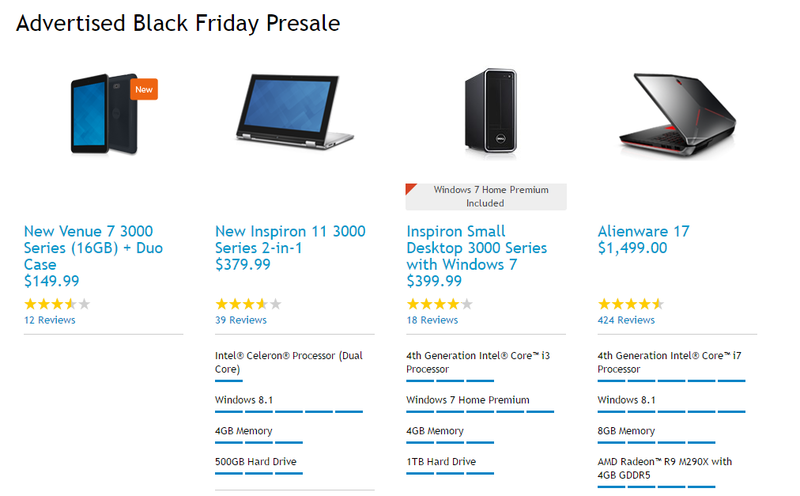 The second, another Dell Black Friday ad for 2014, promotes another Inspiron 15—but for just $190. Meanwhile, Apple and Samsung are selling smartphones for about the same prices they always have—$200 and above, and far more if their carrier-subsidized pricing is removed from the equation. The shift in pricing means the biggest tech presents of the year will be wrapped in the smallest packages. Smartphones—even subsidized ones—are now the premium gifts, while cheaper PCs are arguably a stocking stuffer. Still not sure? Then get in line for the 11-inch Asus EeeBook X2015TA notebook, on sale at Staples for just $100. And oh yes, tablets. They’re in even worse shape, analysts say. While the PC market was originally expected to decline by about six percent this year, analysts now say it will dip only a bit more than three percent. That’s what passes for good news in the PC market these days. But even after expanding into tablets and phones, PC makers are still compelled to chase as many sales as they can during the holidays—and the easiest way to do that is by lowering the price. This Asus laptop from Staples is one of the most aggressive laptop prices for Black Friday 2014. Several related trends further reinforce the PC's role as second fiddle to phones this holiday season. The first is the staying power of smartphone pricing. In 2010 Apple sold the iPhone 4 at a subsidized price of $199 and $299—and left it, unchanged, through the iPhone 6 launch four years later. That same year, Samsung began selling the first of its Galaxy devices under names like the Sprint Epic 4G, for $249. Today, Sprint sells the Galaxy S5 for $199 with a two-year contract. In other words, in 2010 Dell’s doorbuster PC was more expensive than Apple’s priciest phone. Four years later, that same Inspiron—with significantly improved components inside, naturally—is now cheaper than Apple’s least expensive iPhone. NPD analyst Stephen Baker, who tracks retail sales of computers and other technology, says another reason for the PC price decline is more subtle: tablets, or specifically how the PC and phone industries have responded to them. Tablet sales surged in years like 2012, when sales increased 75 percent year-over-year during the fourth quarter. But then phone and notebook PC makers made changes: phones have steadily pushed screen size into “phablet” territory, while notebooks have cut both costs and size to compete with lighter, more portable tablets. 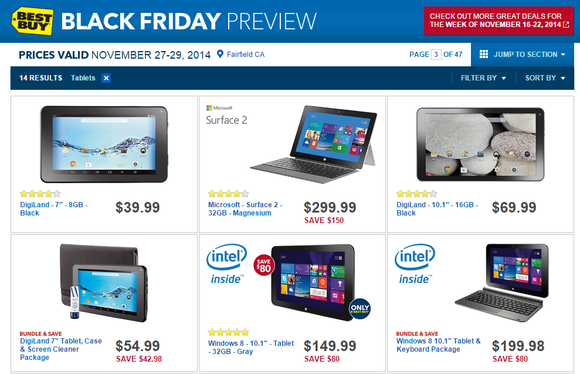 Tablet prices range all over the board for Black Friday 2014, depending on what you're looking for. By July 2014, analyst firms were reporting actual declines in tablet sales, and retailers like Best Buy began praying for a laptop revival. Remember, these are the same laptops whose low-end prices have more than halved in four years. Now, in the eight weeks after the back-to-school season officially ended, Baker said, tablet sales fell 16 percent in terms of unit sales and 18 percent in terms of dollar sales. Even sales of Apple’s iPad are down 15 percent during that period, he added. “We’re seeing tablets getting squeezed right now,” Baker said. Dell executives, who confirmed the authenticity of the ads, said there’s been significant cost compression from Intel or Microsoft that allow Dell to make cheaper notebooks and tablets that are designed for more than just surfing the Web and watching movies. “We’re excited about the fact that technology is more accessible, and that more people are able to buy PCs that couldn’t a few years ago,” Marissa Tarleton, a Dell digital marketing executive, said in an interview. At many retailers, including Dell, Black Friday is a state of mind. Tarleton said that customers are asking for more than products that play games, indirectly making the case for notebooks. Unfortunately, they still want that aspect for free, it seems: Tarleton added that there’d been strong growth in the sub-$300 price range over the past few weeks, as the market “got ready” for Black Friday sales. “What customers have told us that consumption is great, but they need to be able to do more, but on something that doesn’t cost a thousand dollars,” she said. And like many others, Dell has turned to tablets. Its cheapest Black Friday doorbuster is actually the $100 Venue 7 3000, normally priced at $150. 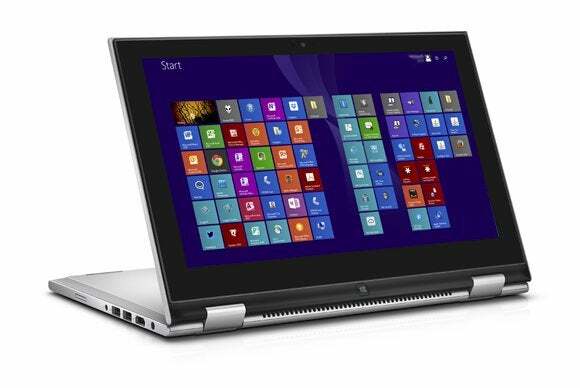 Dell has also announced the Venue 8000, a tablet with an embedded depth camera that it will likely position as a premium, higher-priced tablet. Meanwhile, Dell will continue to invest in gaming notebooks and alternative form factors, particularly two-in-ones, as higher-margin products, Tarleton added. Chromebooks, the low-cost compute devices that run Google’s Chrome OS, haven’t necessarily been showcased in Black Friday circulars, but they’re making an impression nonetheless. Although prices vary, Chromebooks generally range from $200 to $350 or so, and now come loaded with up to 1TB of Google Drive storage, too. Chromebook "landing pages"on sites like Amazon emphasize how compatible the cheap, Google-powered computers are to Windows machines. It’s unclear how Chromebooks will sell on Black Friday and during the holidays, but Microsoft is busy promoting cheap notebooks like the HP Stream 11 as full-flavored Chromebook killers. When asked to comment on its Black Friday strategy, Microsoft declined. What’s not clear, however, is what shoppers will be willing to pay, or what ads will tempt people to click or set foot in a physical store. In years past, phone cases, printers, and other peripherals were the doorbusters. Now, the actual electronic goods themselves are heading toward impulse-buy price points. And yes, that even includes phones: Wal-Mart is offering its own crazy iPhone deals. While the PC historically has been the center of the computing universe, that’s changed. You can make the argument that the phone is at the center of our digital lives now. And the deals that retailers are offering this Black Friday underline that fact.